President Donald Trump went in person Tuesday to pay his respects to the grieving Bush family in his latest show of peacemaking with the political clan he once fought bitterly. Trump, whose ascendancy to the head of the Republican Party saw him exchange vitriolic attacks with the establishment Bushes, has taken pains to demonstrate unity since the death of former president George H.W. Bush, aged 94, on Friday. Ahead of Wednesday’s state funeral -- where Trump will reportedly sit in the front row, but not deliver a eulogy -- the president tweeted he would visit the “wonderful Bush family” at the presidential guest residence Blair House across from the White House. 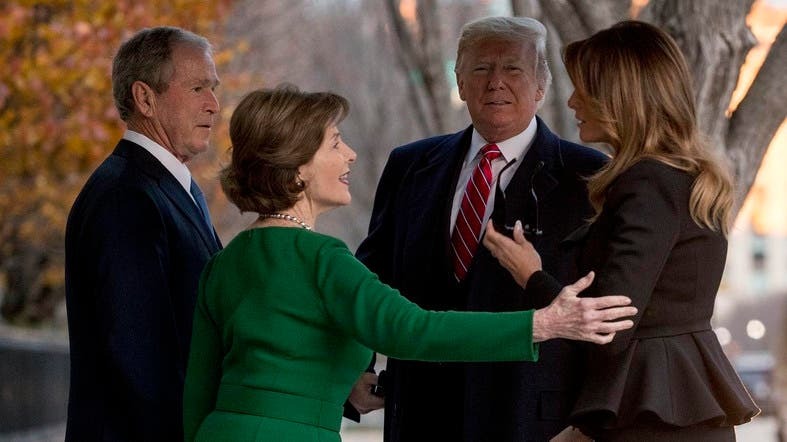 On a chilly afternoon, former president George W. Bush, son of the deceased elder Bush, greeted Trump and the first lady, Melania, outside Blair House and took them inside for the private visit. Earlier, Laura Bush went over to get a tour with Melania of the White House Christmas decorations. Trump’s relations with the Republican establishment have been rocky since his insurgent campaign took him to the party’s nomination and then a shock election win in 2016. He did not attend the funeral this year of George H.W. Bush’s former wife Barbara, even though former presidents Barack Obama, George W. Bush and Bill Clinton were there. The Bush family has assured Trump that eulogies at Wednesday’s funeral will avoid any criticism of him, The Washington Post reported. George H.W. Bush’s body continued to lie in state Tuesday at the US Capitol, where officials said that 21,683 people so far had come to pay their respects.